Many of you have children who are pre-writers. Their busy young minds are bursting with ideas, and their often-hilarious stories and ideas pour forth to the amazement—and amusement—of friends and family. But since they can’t write yet, what happens to these little tales? We think we’ll always remember them, but before we know it, our children’s words have floated away on the breeze. What do you do when young age, immaturity, or lack of skill with a pencil prevents your littles from recording their own brilliant thoughts? Simple! Act as their scribe as they narrate to you. As your child dictates a sentence or a short story to you, write it at the bottom of a large sheet of paper. Next, have him draw or paint a picture at the top of the page to illustrate it. Alternatively, have him create his picture first, and then ask him to tell you a story about his work of art. Write it beneath the illustration. A young or reluctant writer may feel more comfortable retelling a familiar story than trying to plan an original story of her own. Read a paragraph or short book or excerpt to your child. Have her orally tell the story back to you in her own words. Help her by asking questions (Who? What? When? Where? Why? How?). As she narrates her story, write it down word-for-word. Sometimes she will give such a mature-sounding narrative that the only thing to remind you of her young age will be words like “catched” or “brang.” Not only will you have recorded her story, you will have a treasured memory of her early speech habits! Let your child narrate his account into a tape recorder or digital recording device. When his writing skills have developed sufficiently (perhaps by 2nd-4th grade), you may want to have him write his story from dictation. He can stop and start the recording as he writes his own words on paper. Your child can dictate letters to friends or relatives, greetings to missionaries, thank-you notes, etc. If she is old enough, correct grammar and spelling with her and let her recopy the letter in her own writing. To apply this to your schooling, she may write a letter about a field trip she took, a book she read (or you read to her), or an exciting science experiment you did together. What are the benefits of these simple exercises? They teach young children important skills such as retelling a story, observing their world, and organizing their ideas. They boost confidence and pave the way for later writing. Early writers can share the pencil with you, dictating what they cannot write by themselves. Reluctant writers experience the freedom to put together ideas without the limitations and fear of having to write them down. Often, a child’s speaking vocabulary is more advanced than his ability to write. You may find that even your older children’s stories are more colorful and descriptive when they dictate them to you from time to time. Why not try one of these narration activities today? You might just open up a whole new world of words for your pre-writer! What are some of your favorite ways to incorporate narration activities into your schooling? WriteShop Primary is a gentle approach to teaching early writing skills to young children. In particular, Book A is perfect for kindergarteners or first graders who aren’t reading or writing yet, or whose skills are just emerging. Download a sample lesson here. 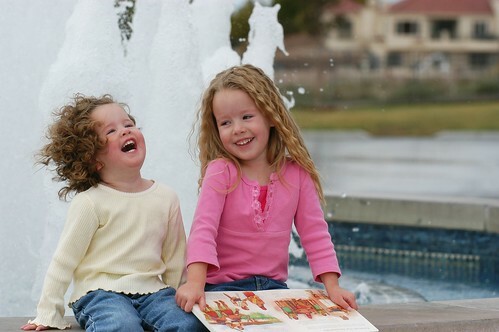 Photo credit: Young girls laughing by a4gpa, courtesy of Creative Commons 2.0. Love, love, LOVE Rainstorm! Trains Stop is pretty cool, too! I can’t remember the author, but all books by that author are fabulous. One of the reasons I checked it out of the library when I stumbled upon it was so my son on the autism spectrum could practice inference skills. Wordless books are a great way for kids of all ages to develop story-writing skills, since the “bones” are all there for them. Thanks for weighing in on some of the book titles, Jenny. There are just so many good ones out there!